Happy News for all travelers who dreams for a journey in ship through Sea…. Government of Kerala – Inland Navigation department cleared all formalities and given permit for an Indian Private company to operate Small Passenger Ship (Ferry type) from KOCHI to KOZHIKODE and KOZHIKODE to KOCHI. 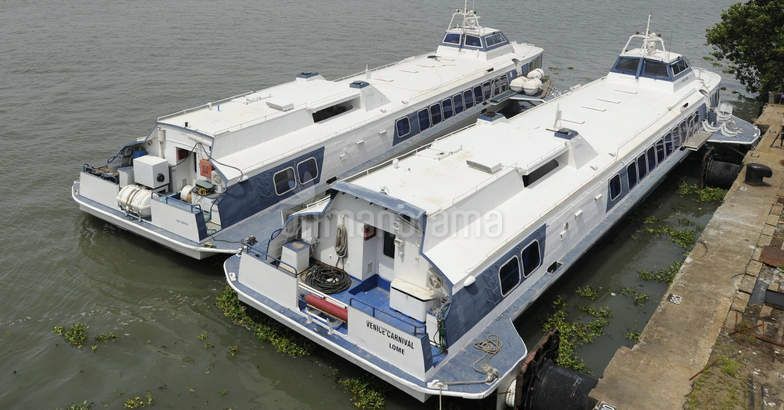 It is expected to get inaugurate the maiden trip during Onam holidays in September 2016. The first ship for the operation was bought to Kochi during July 2nd week from Athens- Greece. 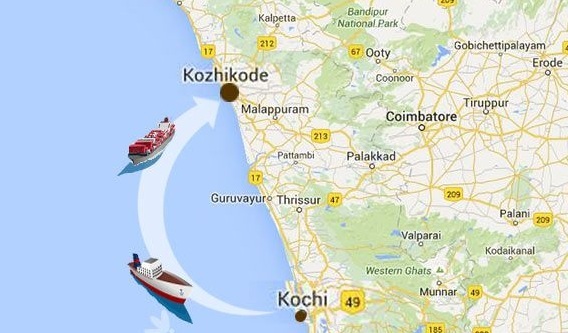 It takes around 3.5 to 4 hours to reach Kozhikode from Kochi. It’s a boom for daily commuters/ tourists who either do not get a ticket in AC train or get jammed in normal busy traffic in roads. Through inaugurating this project Government of Kerala clearly shows its vision in diversifying the Tourism intake to Gods own country using different channels to promote the hidden treasures in the state. 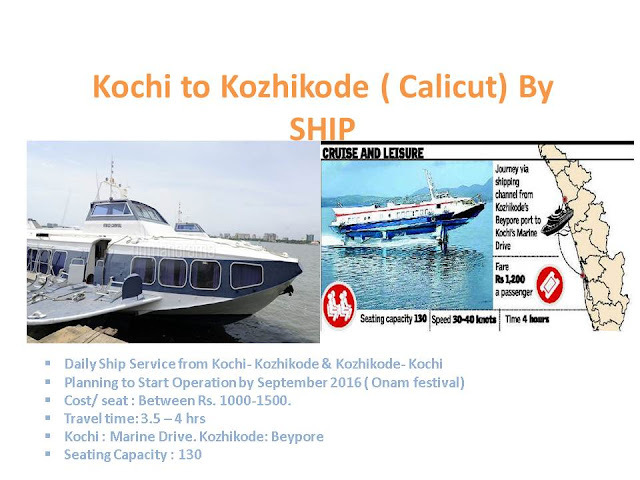 The project was earlier announced by former Chief Minister Mr. Ommen Chandy in March 2016. 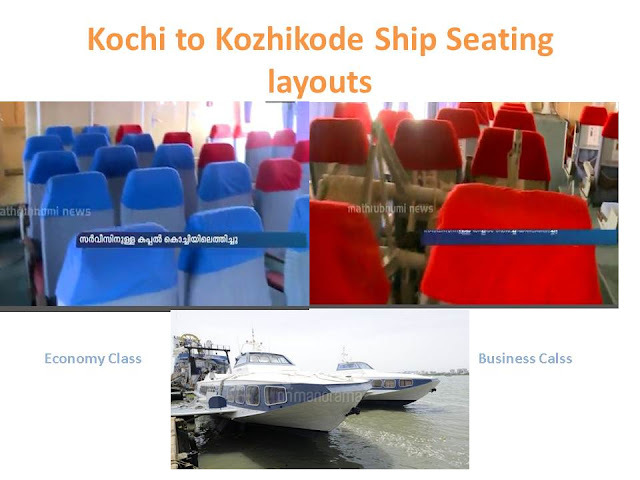 Promoters claimed that like in flights ships will be having 2 classes namely ECONOMY for budget passengers and BUSINESS CLASS for luxury passengers. All food during the travel will be served similar in flights. Most significant part of the ship is in its safety. It has got 5 large Russian made jackets to hold up to 30 passenger’s / jacket safely for days along with food. 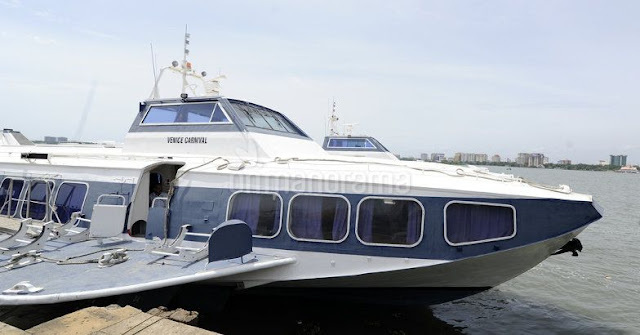 Presently base cost / passenger is planned to be fixed in between Rs. 1000- 1500. Government of Kerala is also trying to give 30% discount as subsidy on fares to promote the new venture which will be a flag ship project under State. We TEAM Jumborooms.com wishes all success to the whole TEAM behind this project and let Kerala Tourism blossoms with new similar initiatives .... ALL THE BEST WISHES..